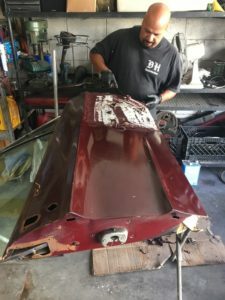 Paint Removal for Classic Cars | Stripping Paint | DH Automotive, Inc. This next step in our “Creating the Perfect Paint Job” series is all about elbow grease and is the most labor intensive phase of the process as it Because of that we’re going to break this step down into two parts: Part A, will have to do with the paint removal and our next post, Part B, will detail how to perform the body work. So without further ado, let’s get started. Way back in the first post to kick of this series I mentioned that most people have asked me if they could leave the old paint and just sand it down smooth. 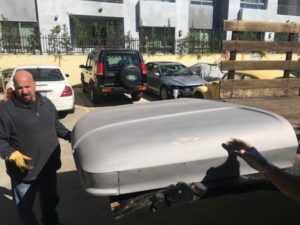 Although you can certainly do so, it’s been my experience that old paint tends to come back and haunt you like a ghost, especially around areas that are in heavy use like the trunk, driver side door and hood. During the paint removal process it’s much better to start with a clean slate, you’ll be glad you did. There are several ways to do this, one of which is by having the car chemically dipped, meaning that the body must be stripped down to a bare shell. Because this is very labor intensive and costly, this may not be an option for you. 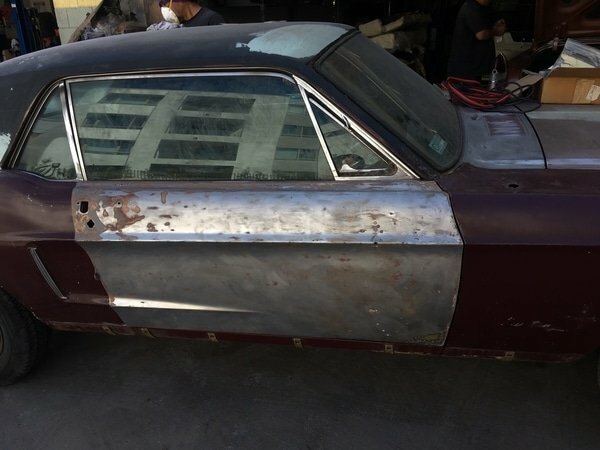 The second option is having the fenders, hood, doors and trunk sandblasted, which also needs to have a bare shell due to the damage sand can do to chrome, glass, electrical, etc. Again, however, this can be pretty labor intensive and can cost you a pretty penny and then some. That said our third paint removal option, and the one we’ll be focusing on today is to employ the good old paint stripper technique. When I was starting out I had very little money to do the first two options. The paint stripping method was affordable and I had the time to do the work, so I stripped it down to bare metal and started from a clean slate as I suggested earlier. Lets say again that all the chrome and weather-striping has been removed and you’re ready to get started. The first thing you’re going to want to do is make a list of your trouble spots. These are spots that have been repaired before so they have extra body filler. You’ll want to use a grinder after the stripping process to finish cleaning away any debris left after this process. These days you can pick up paint stripper from most auto parts and/or hardware stores. You’ll also want to invest in a good face mask (buy a box of disposable ones). Same with gloves and a good solid pair of protective glasses as both are key to making this process a fun filled adventure. Beware of this stuff as it will burn like hell if it comes in contact with your skin. I can’t tell you how many times I ran to the sink to with my fingers on fire due to the burning sensation. Don’t make the same mistake I did. I’m assuming the car is in a well ventilated area either outside or in the garage with the door open, if not you won’t get that far. Because an elephant is eaten one bite at a time I like to begin at the rear of the car and work forward ending with the hood and front fenders. Start off with a small section, say 2 feet x 2 feet and apply the stripper. This stuff is like a clear jelly so imagine the section as a piece of toast spread on a ample amount and allow it to do its thing. In a matter of minutes you’ll see the paint begin to bubble. Next you’ll need a 2 inch scraper, or better yet a razor blade scraper so that you can start removing the paint. Now if you’re lucky there’s not too much paint to be removed and this process will go rather quickly. Most of the time however you’ll be dealing with multiple layers of paint then primer so you will have to hit the section a few times to make sure you get down to the bare metal. Once the car is down to bare metal you’ll probably still have some debris from the stripper which needs to be cleaned. At this time get yourself a bucket full of soapy water (dish soap works the best) and wet/dry sandpaper (220 grit) and go over the sections making sure to remove all the excess paint and stripper. Once that is complete go back over with glass cleaner and paper towels to complete this process. And with that you can relax and give yourself a pat on the back for completing a paint removal process the right way. Take a break to reflect upon what you’ve done and prepare yourself for the next part of the process, which will be the body work that we’ll cover in the next post.